Have you ever wanted to learn basic sewing skills? You know, for those skirts and pants you want to hem? Or that button that needs reattaching? Or you’ve been wanting to sew on that rad patch you have? Then please join this FREE event in honor of Fashion Revolution Week! 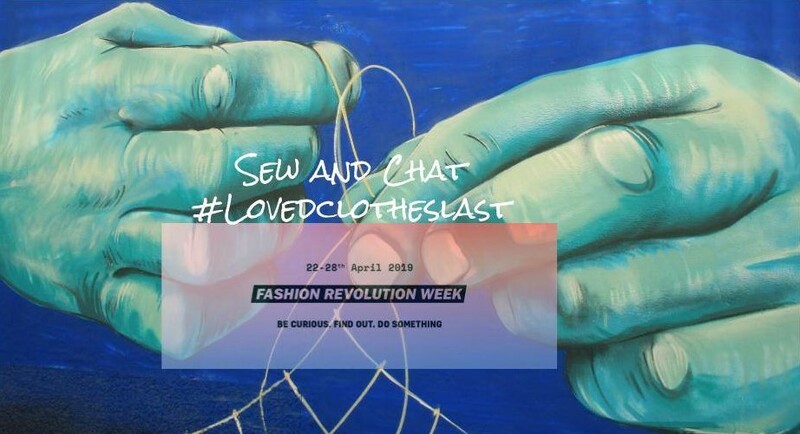 A group of local Fashion Revolutionaries will be hosting a Sew & Chat event at The Disco Dolls studio to show you how to mend your favorite garments, to ensure your loved clothes last. WHO is this for: Anyone, of any skill level, that has an interest in making their clothes last and learning about the positive impact you WHAT to bring: Garments that need to be hemmed, a button replaced, or a patch/ rip repair. A small sewing kit (needle, thread, and scissors). Don’t worry if you don’t have a sewing kit, they will also be available for purchase in the studio for $15. What is INCLUDED: Sewing instructions, buttons and patches to use, extra garments, in case you don’t have anything to mend, but are still interested in learning, and complimentary beverages. Sewing Instructors include Leigh Anne Balzekas of Disco Dolls, Beth of Disco Dolls, Ericka Leigh of Sewn Apart, Marisa Griffin, Danette Marie Albino from La Bambola. *NOTE This event is being held at The Disco Dolls Studio. Did you get dressed today? Do you love fashion? Have you ever thought about where your clothes came from or who made them? Are you interested in learning more about the fashion and textile industry and its effect on our world? Then join us, a group of local Fashion Revolutionaries, for a guided discussion of why we need a Fashion Revolution and how you can help! Learn about what you can do in your community, and meet like-minded people who share your passion for creating a better world. This is a special “make & take” rollerball class for all the girl bosses out there! Want to stay focused, have more energy to keep hustling & crush your goals? During this special class you’ll learn all about how essential oils can help you be the best “Boss Babe” you can be...naturally! Boss Babe Club will have recipes for several special essential oil blends especially for female entrepreneurs & girls with goals! Join us for drinks, light appetizers, education & essential oil fun! Ps. This event is graciously being hosted by Valhalla Resale Shop - memberships will be 1/2 off the night of this class! If you don’t have a membership, trust me you need one ASAP! Have you ever wondered about solar energy? Interested in getting solar panels installed on your home? Well, on October 24th, we'll have a representative from Radiant Solar Advisors to explain how the process works and how you may qualify to start producing your own power without putting any money down. You can hear from the owner of Valhalla, Danielle Ferrari, how she enjoys the solar panels installed on her home. Start on the path towards energy independence and start saving some money in the process.